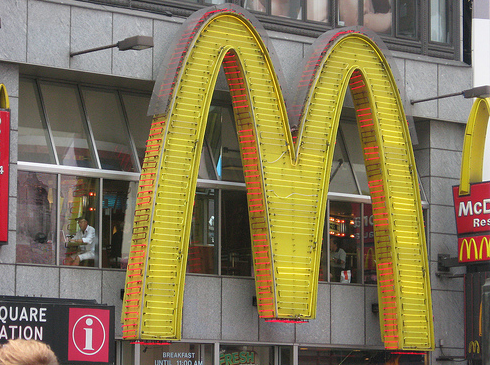 In an agreement with the New York state Attorney General’s office, the owner of several McDonald’s locations in Manhattan will pay $500,000 to settle allegations that his company shortchanged 1,600 current and former employees at the fast food chain. New York Attorney General Eric Schneiderman announced the $500,000 settlement with the Manhattan restaurants and their owner Richard Cisneros for failing to pay legally required laundry allowances for many employees, for uncompensated work time and for unlawful deductions from wages. The investigation into wage theft found that from 2007 to July 2013, the Cisneros Group restaurants failed to pay 700 cashiers for time periods when they worked “off-the-clock” before and after some of their shifts. The restaurants also required some cashiers to make up cash register shortages out of their own money. Additionally, the investigation found the franchises violated two New York laws. One law, which Consumerist has covered in the past, requires that employers either launder uniforms, provide sufficient wash and wear uniforms for each day of the work week or pay employees a “uniform maintenance allowance”. The second violation came when the restaurants did not provide workers an extra hour of minimum wage when they work more than 10 hours in a day. Following Tuesday’s announcement, Schneiderman made it clear that fast food restaurants must follow labor laws like any other business in New York. “Our lowest wage workers deserve the same protections of the law as everyone else. It’s critical, for them and for their families as well as for our economy, that we remain vigilant so that no New Yorkers are cheated out of their hard won earnings,” he said in a new release. Advocates for economic justice commended the attorney general’s office for their work on behalf of minimum wage workers. Last week, Consumerist reported that McDonald’s employees in California, Michigan and New York filed a total of seven class-action suits against the fast food chain and various franchise operators. Those lawsuits allege a variety of violations including falling to pay overtime, making employees work undocumented hours and violation of the Fair Labor Standards Act regarding uniforms. Next Are You Having Trouble With The Dunkin’ Donuts Sip Scratch Score Game? Next Up: Are You Having Trouble With The Dunkin’ Donuts Sip Scratch Score Game?